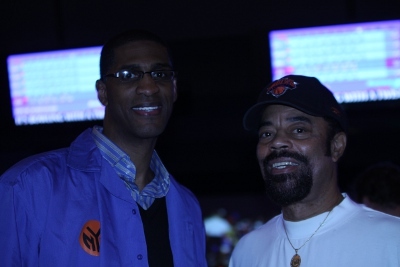 The New York Knicks and their celebrity friends hosted their annual “Knicks Bowl 12″ event last night to raise funds for the Garden of Dreams Foundation, a 501(c)3 non-profit charity created in 2006. 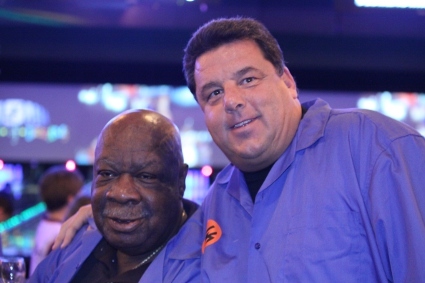 The Foundation has touched the lives of 165,000 children in its many endeavors and the annual Knicks Bowl event has raised more than $1.7 million since it began in 2000. Many of the Knicks players, past and present, including Kelenna Azubuike, Wilson Chandler, Toney Douglas, Raymond Felton, Landry Fields, Walt “Clyde” Frasier, Danilo Gallinari, Roger Mason, Jr, Timofey Mozgov, Cal Ramsey, Andy Rautins, Charles Smith, John Starks, Amar’e Stoudemire, Ronny Turiaf, Bill Walker, John Wallace, assistant coach Herb Williams and Shawne Williams were joined by celebrities like Hip-Hop artist Fabolous and actor Steve Schirripa. Azubuike, who was born in London, England, and raised in Tulsa, Oklahoma, has a history of doing community service and was thrilled to be able to be a part of the event. “It brings back memories” Kelenna said, a passionate Christian, when we caught up with him while mingling with many fans and teammates. I also spoke with fellow New York University Alumnus and Knicks Director of Special Events and Community Relations Cal Ramsey. When asked about the feeling of being able to give back, Mr. Ramsey replied “I love it. I’ve been involved in community service in New York City since 1968.” When asked about the NYU Violets, Mr. Ramsey, still an assistant coach on the Men’s team, informed me they began the season 11-0, but are unfortunately 1-8 in conference play after a loss last week. 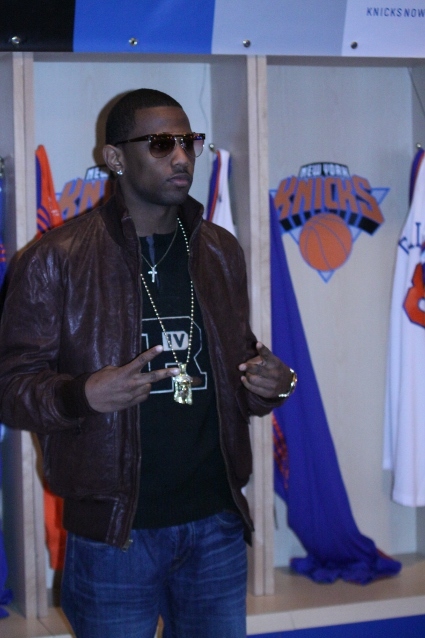 Mr. Ramsey is extremely excited about the Knicks this year. “The Knicks have played great basketball this year” he responded, citing wins over the San Antonio Spurs, Miami Heat, and the almost-victory over the Boston Celtics, when a three-pointer by Amar’e Stoudemire was ruled to have come after regulation had ended. 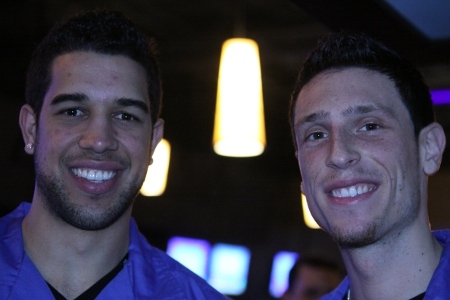 Rookies and close friends Landry Fields and Andy Rautins were also thrilled to be a part of the event. When asked about the effects of the Garden of Dreams on the youth in the New York City-area, Rautins responded “I think it’s huge, especially in a city like New York.” “He took the words right out of my mouth” Fields said when asked a similar question. 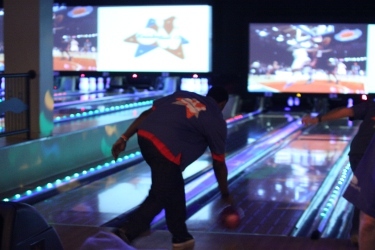 The atmosphere was electric in Chelsea Piers 300, where kids and adults alike bowled, mingled and got autographs from their favorite Knicks and entertainers. 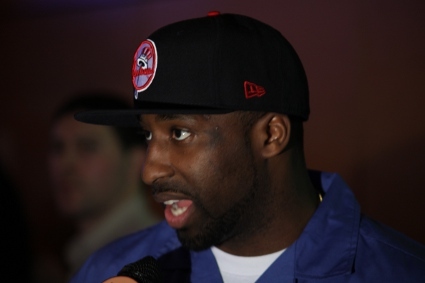 I would strongly suggest being on the lookout for Knicks Bowl 13 if you are a New York Knicks fan, someone who likes to give back to the community, or both. You won’t be disappointed. Very good stuff. In a world where all the bad athletes do is featured, its good to see a story where they are giving back. Agreed. I think that NBA players do more than all others in this area. It has become a passion of mine to cover this events, and I have attended five of them. 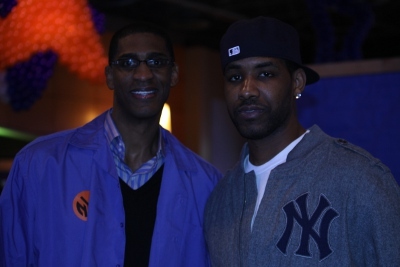 Check out the Ronny Turiaf post http://razzandjazzsports.wordpress.com/2011/03/08/ronny-turiaf-heart/ This dude did a great thing for a school in the Bronx.